Instructions: Cut a piece of white cardstock to 10 x 7" size, score and fold at 5" to create card base. Cut a background paper scene from the collection to 6 3/4 x 4 3/4" size. Lightly sponge edges with Cactus Flower ink and attach onto card base. Stamp the wonderful day sentiment from the Special Birthday Sentiments stamp set in Cactus Flower ink onto top half of card as pictured. Stamp large 2x, medium 2x and small cherry blossoms 1x from HCPC-3866 Tweet Cherry Blossoms Stamp Set in the Majestic Violet ink onto white cardstock and diecut with coordinating dies. Stamp right facing leafy branch 2x from HCPC-3867 Cherry Blossom Retreat Cling Stamp Set in Olive ink onto white cardstock and diecut with coordinating dies. Stamp the birdies from HCPC-3866 Tweet Cherry Blossoms stamp set in Forget-Me-Not ink onto white cardstock and diecut with coordinating dies. Stamp the wishing well, flower pot and watering can from HCPC-3868 Wishing Well Oasis Cling Stamp set in Black onto white cardstock and diecut with coordinating dies. Use the Stack and Store daubers to color the images. Color the edges of cherry blossoms with Cactus Flower ink, shading darker on the edges and softly in the centers. Use Leaf Green on the leafy branch and leaves. Use Forget-Me-Not ink on the top of baby birdies' bodies and Rose Madder ink on the bellies. Use the Coffee ink on the watering can and flower pot. Use the dark gray, light gray, brown, oatmeal, mid green, light green, pale green, pink and light pink markers from Zig set to color in the wishing well as pictured. Use the green and pink markers on the flowers and leaves in the flower pot. Use the Watercolor Brush blender along with the markers. 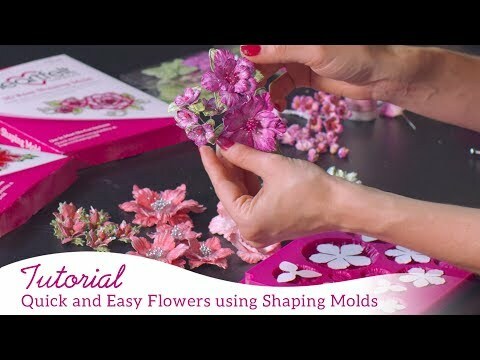 Place the cherry blossoms and birdies into the HCFB1-474 3D Cherry Blossom Shaping Mold, lightly mist with water and send through die cutting machine. Use the stylus from the HCST1-401 Deluxe Flower shaping kit to shape leafy branch, leaves and rest of images as desired. Assemble the cherry blossoms. Dip white bud stamens from Bridal Bouquet small set into the Cactus Flower ink. Thread these stamens and the purple rock candy ones through the centers of blossoms and attach with hot glue. For the small bud blossoms, leave the stamen thread at a longer length on the backside and trim off extra thread on rest of blossoms. Use glue to attach the leafy branches on the top of card. Use glue and Double dots to attach wishing well, flower pot, watering can and birdies. Use hot glue to attach leaves and cherry blossoms onto card as shown. Use the Dries Clear glue along with Crystal glitter to add a touch of sparkle over blossoms, leaves and rest of card as desired.